Learn all about OIC/DC and why we're the right choice for unemployed individuals seeking professional development. We believe that people living in poverty need jobs, but not just any jobs. They need jobs that will enable them to be self-sufficient, maintain their families, and invest in home ownership and their community. Employment, self-sufficiency, a stable family life and home ownership are parts of a safe and stable community. The relationship between these factors and their connection to a community's quality of life has been researched and confirmed time and time again. It is a relationship that demonstrates how the increase in one of these factors increases in all of the factors, thereby positively affecting the overall health and vitality of the community. 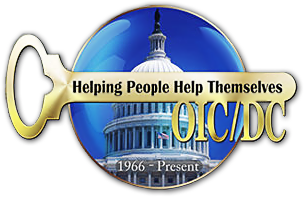 OIC/DC is a 501c3 non-profit, community based organization with more than 50 years of experience providing workforce development services for District's youth and adults. OIC/DC has three sites: two located in Ward 8 and one in Ward 1.0IC/DC is a licensed Post-Secondary Non-Degree Institution. OIC/DC is also a certified Certiport Testing Center.OIC/DC is a part of a national network of OIC's that provide workforce development services in more than 35 cities around the country. This network allows OIC/DC to have a direct "pipeline" to "best practices" in workforce development. OIC/DC's mission is to provide a quality integrated education and training program (IE&T) for adults and youth, in an effort to assist them in taking control of their lives and building educational skills and work- related competencies, as they enter the mainstream workforce on the road to self-sufficiency. OIC/DC offers integrated education and training services to District residents with emphasis on preparing them for careers in two demand industries: Business Administration/Information Technology and Healthcare. The provision of IE&T services aligns OIC/DC's mission to collaborate and partner with local and federal governments, the private sector, community based organizations, employers and other stakeholders to prepare youth and adults for successful career opportunities while meeting the needs of employers for a skilled and educated workforce. OIC/DC provides job training for high demand occupations, concurrently with literacy, numeracy, workforce preparation and job placement services for adults and youth, especially socio-economically disadvantages residents in the District of Columbia, using best practices and evidence-based models. Program offerings include CompTIA A+ Computer Repair Certification, Business Office Support Specialist with Microsoft Office Certification, Customer Service Certification for Retail Sales/ Hospitality and Home Health Care Aide Certification. OIC/DC's goal is to prepare students to be successful in the pursuit of their career path. OIC/DC is dedicated to placing participants in full-time, good-paying jobs. Our vision is every person in Washington, DC, who wants a job, will have a living wage job that will support themselves and their families. Employers Should Be Involved in the Development of Program Content & Outcome Standards.